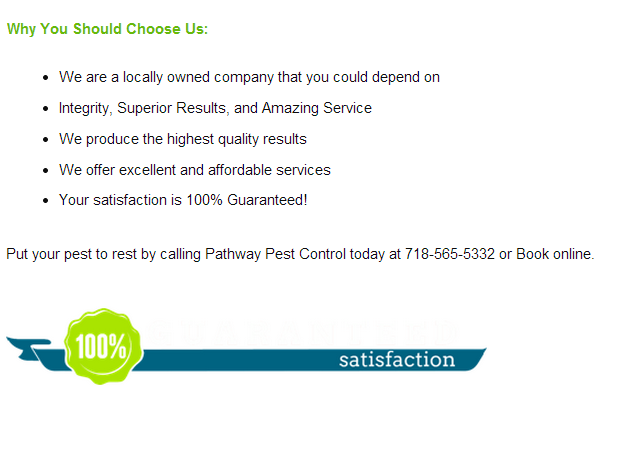 The Professionals at Pathway Pest Control in all the 5 Borough of New York and Long Island Provide you with the best pest control and services around at Pathway only the safest and the most effective pest treatments are used by our highly – trained professionals .We will keep both your employees and your customer’s safe during the process .Your employees and customers will be glad to know that we use environmentally – friendly pest treatments .Call us with your pest problem now so that we can get out there today to help . Restaurant, schools, offices , supermarkets, warehouses, Bar and Grill, Bakery, Health care facilities Pharmaceutical , retail stores, Food processing, Apartment Building, Hotels, Motels, Demolition rodent treatments and certificates etc . Expertise our technicians are highly trained and experience in the business, so you can rest assured. $450.00 per apt up to 4 visits. $ 75.00 for additional unit.